February 14, 2019 - With the conclusion of The Price of Freedom we are one step closer to the 2019 Eternal World Championship, and two more players have earned an invitation to the main event. Congratulations to GT100 and Avyoine for advancing to the next round, and to all those who qualified for the ECQ. Underdog Stonescar Scrappy Hour prevailed in the end, while Winchest Midrange continued to be strongly represented in the Top Eight decks from the competition. Overall however, a much more diverse range of strategies were seen in the follow-up to Burning Hope. Shadow sources are heavily favored for Witching Hour (25 ) as well as Turn 4 Market cards In Cold Blood (4 ) and Burglarize (4 ). A full playset of Granite Waystone is an obvious choice for a Grenadin-focussed strategy. 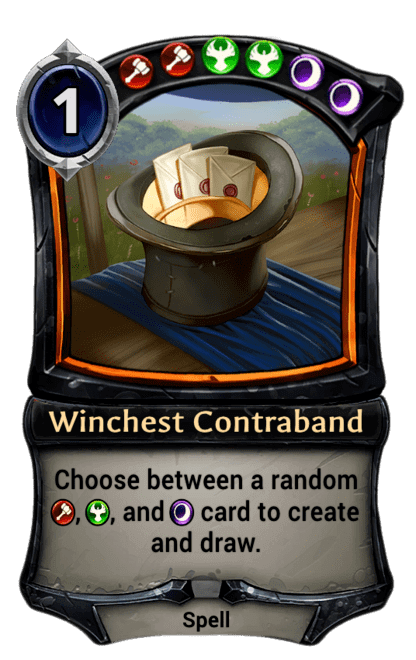 Standout feature: Without any Justice Influence sources, Winchest Cargo will never Transmute into Wichest Contraband. But unlike Seek Power, the 1-cost Mult-faction Spell may be swapped in and out of the Market. It can also allow GT100 to potentially deceive unsuspecting opponents by masquerading as a Winchest deck early on. An even distribution of Fire, Justice and Shadow sources waiting to be drawn by 4x Seek Power. 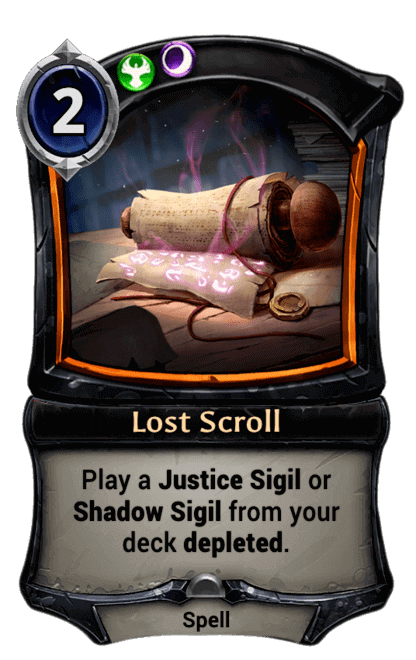 Additional ramp comes in the shape of 3x Lost Scroll (2 ). Meanwhile, the Lingering Influence (2 ) of the late Rolant surrounds Regent's Tomb (4 ). That extra Power draw helps Avyoine get to the late game quicker, as does the cost reduction to cards mined from Quarry (2 ). Standout feature: One of two nearly identical Winchest decks in the Top 8, the second-place finisher opts for End of the Story (6 ), an additional sweeper in the Market. A fresh take on Xenan Midrange. Time sources are marginally prioritized over Shadow for an early Teacher of Humility (2 ), and also for Worldbearer Behemoth (5 ) - the only triple Influence card in the list. 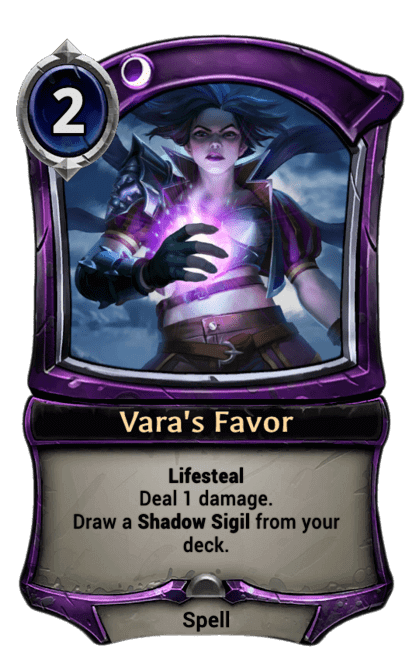 Full sets of both Vara's Favor (2 ) and Amber Waystone provide a bit of extra lifegain in addition to Power and Influence. Standout feature: A unique Site-heavy build that Stormblessed has been quietly winning with on ladder. Expect to see more of this novel variant in Ranked following their strong finish in the Qualifier. Jennev Peaks seemed poised to be the favorite leading up to the event, but in the end the archetype earned only one spot in the Top 8. JuliusNovachrono's build includes every Crest available to the Alliance, as well as a full set of Seek Power to help meet the demanding Influence requirements. 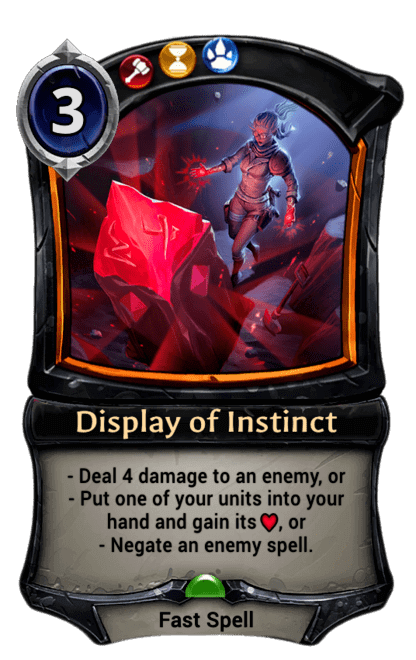 Standout feature: Praxis Banner in the Black Market sets up a timely Torch (1 ) or Permafrost(1 ) combo when paired with any of the deck's eight Smugglers. The Eternal Tournament Series 2017 World Champion makes his ECQ debut with this list, falling just short of the finals for the event. Several characteristics help to distinguish camat0's build from the other two Winchest decks found in the Top Eight. 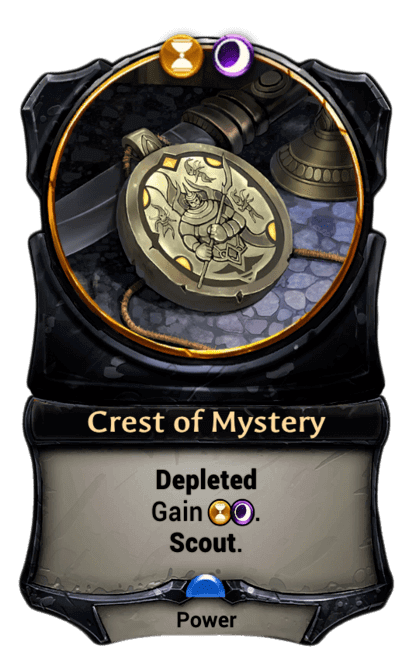 Every available Crest is included, and 3x Winchest Cargo are favored over Lost Scroll (2 ). The absence of Cauldron Cookbook (2 ) allows camat0 to go a little lighter on Fire sources. Standout feature: Slay (3 ) is notably replaced by less costly removal spells Annihilate (2 ) and Vanquish (2 ). This likely helps to enable more efficient cudgel-making while one of the deck's three Statuary Maiden (4 ) is in play. A deck that breaks a lot of rules when it comes to constructing a Power base: Azindel, Revealed (8 ) in a list that lacks any natural Time sources? Privilege of Rank (3 ) without any other Justice Spells or Units? Upon closer inspection, it all makes sense. Although isomorphic could technically gain from a back-to-back pair of early Diplomatic Seals, the real strategy here is to reanimate Azindel, Revealed with Grasping at Shadows (5 ) or Vara, Fate-touched (8 ). Privilege of Rank is included solely as a Power source, without regard to Influence. When combined with the plethora of discard effects, the Justice spell ensures that Power will nearly always be in hand - even if it is off-color. 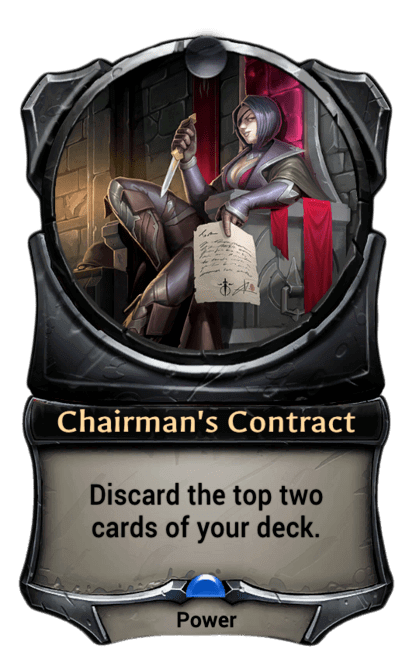 Standout feature: Rarely seen until recently, the self-milling Fall of Argenport Power card Chairman's Contract has risen in popularity with the demand for discard effects created by the recent buff to Vara, Fate-Touched. No less than 30 Yetis are jammed into this Tribal variation on Skycrag Aggro. Primal is given slight priority over Fire, most likely to reliably play Wump, Party Starter (3 ) on time. Two of Shugo Standard and a single Granite Waystone provide Thalian with some extra aggression in a main deck that tops out at 4 Power. Standout feature: With more Yeti per square inch than a Snowfort, the tribal Power source Common Cause does a better job here than Diplomatic Seal. 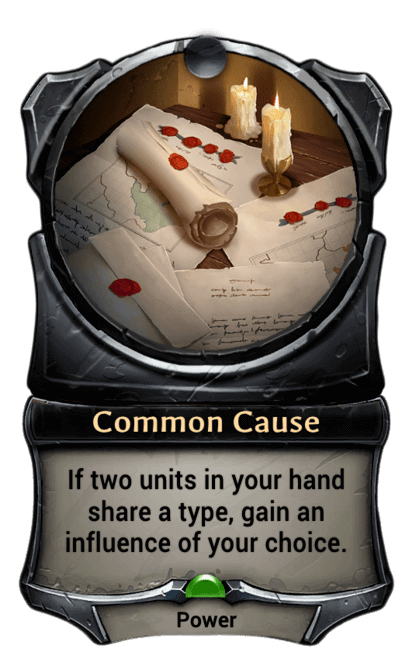 Thalian is almost always likely to have more than one Yeti in hand, enabling Common Cause to deliver both un-Depleted Power and the required Influence at any stage of the game. Identical to Avyoine's deck apart from one difference in the Black Market. Standout feature: Stooglefish has opted to stock their eight Smugglers with an Adjuicator's Gavel, helping to defend against Reanimator strageties which have soared in popularity since the recent buff to Vara, Fate-Touched. 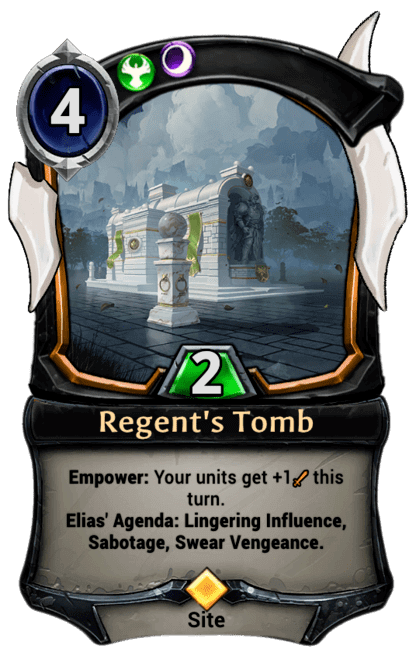 As announced during the tournament stream, the next Eternal Championship Qualifier will take place in March.